What color should I paint the front of the house? Everyone who plans to create or update the format of the facing of the house thinks about this question. Color – this is nothing like the mood of the owner of the property to create an image of your object and its taste preferences. According to statistics, connoisseurs of laconic style choose calm and laconic colors: white, gray, sand, cream. As for fans of creativity, you can not stop here on one color, but create their combination. The dark brown roof accepts the use of light or warm colors, which create a certain contrast. White, cream, light orange, sandy will be the optimal solution. 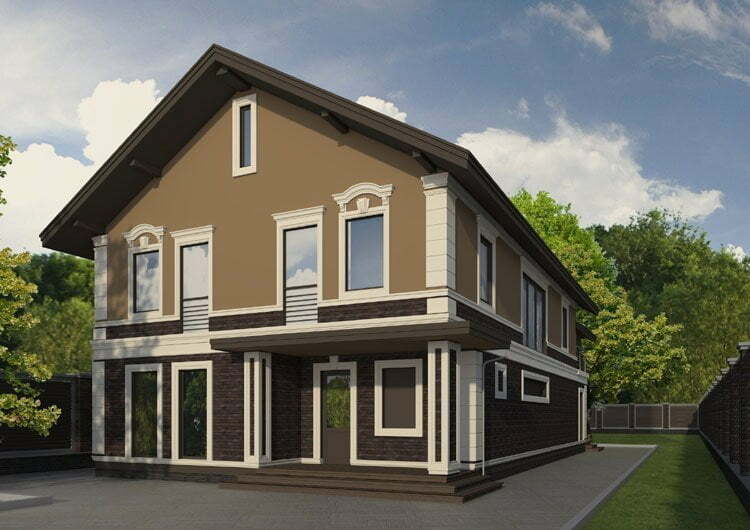 To the brown roof it is possible to choose a brown facade for several tones lighter. The presence of light decorative elements is important here. Best perform the role of horizontal moldings (skirting) on ​​the entire area of ​​the wall. Do not combine a brown roof with bright shades: pink, red, green, blue, purple, yellow. Exceptions are dull shades of yellow, orange, blue. The golden rule of designers – if you want to decorate a house in several colors, then one of the colors should be a few shades lighter or darker. If the facade of the house has materials of cold shades (masonry, brick, concrete panels, metal sheets), then add it with bright colors. The combination of gray and many dark colors with expressive will create an original combination. We suggest you familiarize yourself with the section – the colors of the facades of the houses photo. Here you will find creative and stylish ideas of our designers. 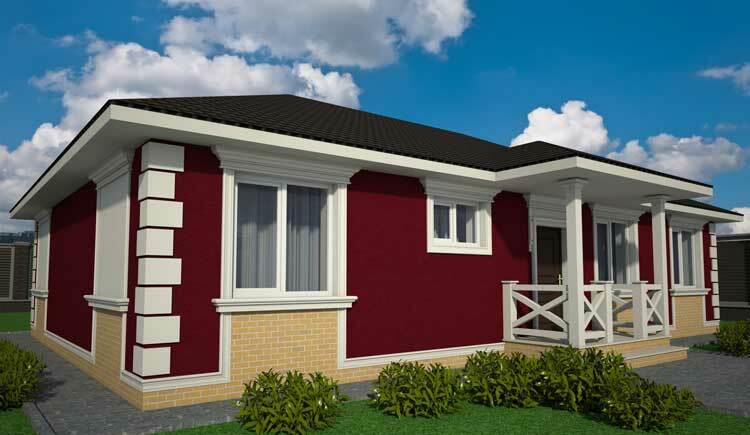 You can order the design of the facade according to the individual design taking into account the style features of the house. Today, the style of minimalism is very actual in the design of the facades. The presence of straight lines, monotony and laconism will create a solid appearance for your home. The appearance on the facade of geometric patterns of dark or colored shades on a light background is original. For example, if the house has an attic, then its area can be highlighted in a different color. 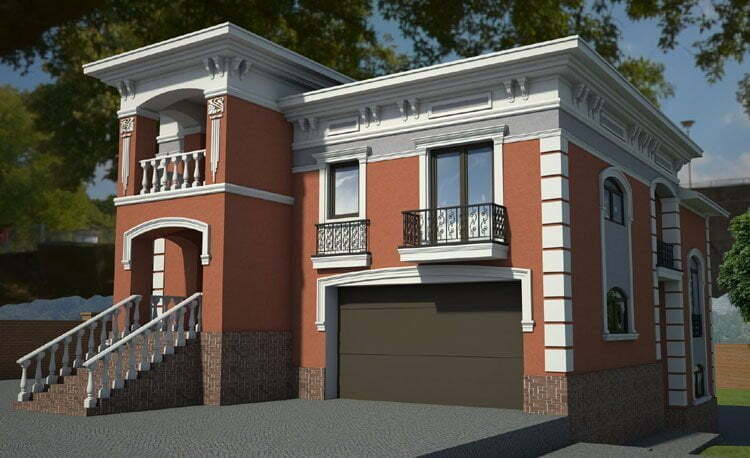 This will dilute the boring and monotonous exterior, create a harmonious design. The color solution of the facades of private houses is a reliable way to change the image of the house with the help of a color palette. Order a free consultation of a professional color designer.